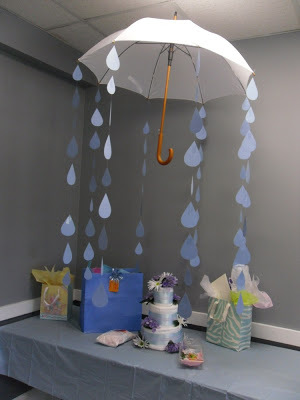 Why not get extra cute and fancy and host a baby "shower" with an "Umbrella Baby Shower Theme!" 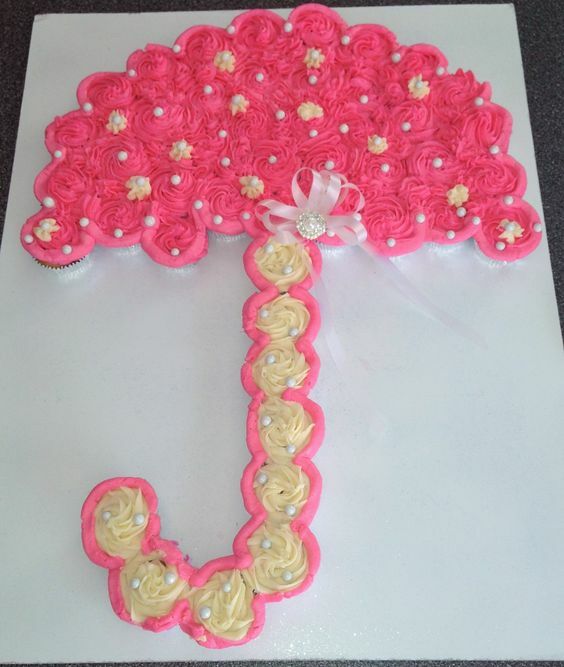 An umbrella themed shower is perfect for a baby sprinkle, where not as many gifts are needed! Below are a few clever ideas to get your creative juices flowing! FREE printable umbrella clip art below! 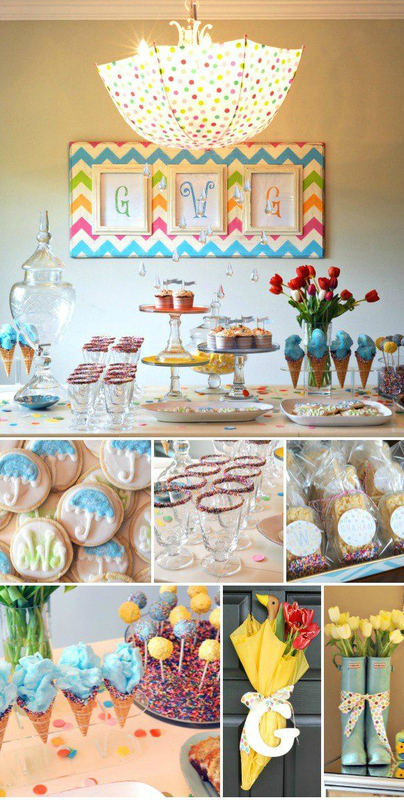 You can see this adorable baby shower sprinkle over at WeHeartParties! I stumbled across this gem of a party and just had to share it with you all. The bright pops of color used for this sprinkle are so cheerful, I just love everything about it! My favorites are the hanging polka dot umbrella chandelier and the cute umbrella door hanger with a duck and flowers popping out of it. Simply the best! BlogLovin had this amazing garden party featured on their site and it is just perfect! The atmosphere is so cheerful - who wouldn't want to be a guest at this party? I whipped up these cuties to jazz up your water bottles! 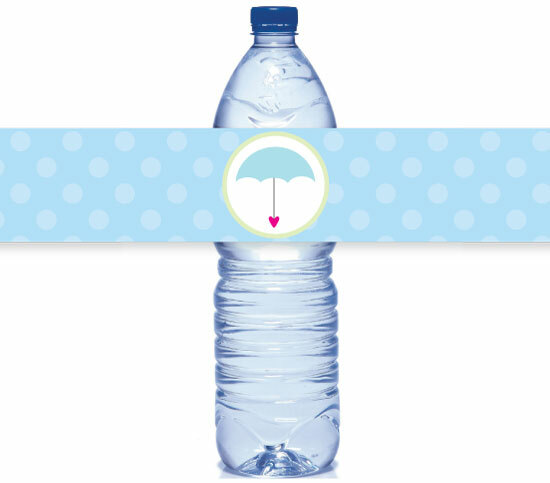 Simply print, cut and wrap around bottled water. You can find them at our printable shop. 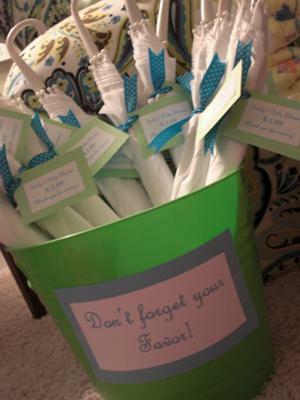 Aren't these umbrella favors just adorable? 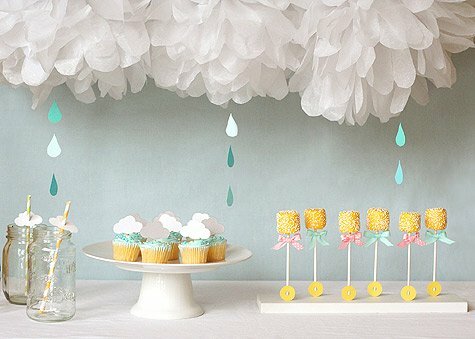 Cute paper umbrellas filled with yummy candy! You can find the complete tutorial over at UnoriginalMom. These cute cakes were submitted by our readers. (Plumas Lake, CA, USA) It's Raining Babies! I used Wilton's 18" half round cake pan for this. I made the cake from Duncan Hines Marble Fudge using 3 cake mixes. I baked the cake for about 65 minutes and let cool completely. I covered a large wooden cutting board in aluminum foil and wrapped the edge with a coordinating pink ribbon. I turned the cake out onto the cutting board. When I removed the cake from the pan the one edge refused to leave the pan so I was left with a chunk missing from the upper left side. I forged ahead anyways and made the frosting with my favorite decorator frosting (1 1/2 C. butter flavor shortening, 1/2 C butter, 2 TBSP Vanilla, 4 TBSP Water, pinch of salt, 2 LBS confectioners sugar. Mix shortening and butter until well blended, add liquids, mix until smooth, add pinch of salt, mix, add confectioners sugar a little at a time until well blended. I tinted most of the frosting pink, reserving a cup and half to add cocoa to for the brown/chocolate frosting. I frosted the cake with a crumb coat of pink frosting and let set. I frosted with a final coat and let set, the key is to work the frosting as little as possible to keep it smooth. 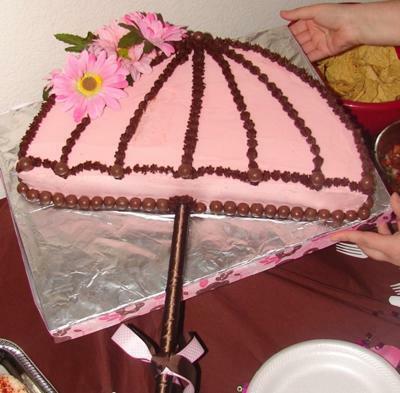 I used Whoppers malted milk balls for the bottom edge and piped the lines of the umbrella with the chocolate frosting and a star tip (16 I think). I still had the dilemma of the chunk missing from the top left so I took some silk flowers I had on hand and arranged them in the empty spot. Voila, instant beauty! 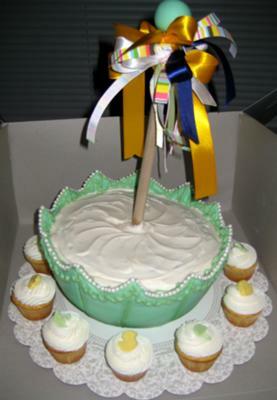 I took a wooden dowel and covered one end of it with plastic wrap to stick in the cake. I pushed it most of the way through so it wouldn't tip and then covered the rest with chocolate colored satin ribbon and tied a coordinating pink, printed ribbon at the end. I had a lot of fun making this cake and enjoy telling my friends it was by far the easiest cake I have ever made! For this cute umbrella cake, pour cake mix in a metal, oven safe bowl - then transfer to a cute plastic bowl, once cooled. Frost and cover up any gaps. Insert a wooden dowel and add cute ribbon to the top. Make cute cupcakes to match. This cute umbrella with falling raindrops from A Work In Progress Blog is truly amazing! 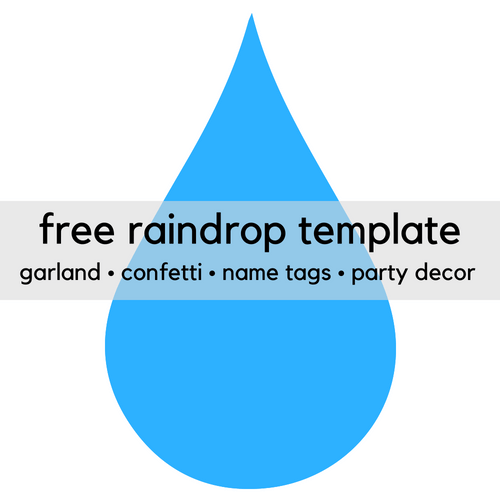 I made this FREE raindrop template so you can easily recreate this look for your baby shower. 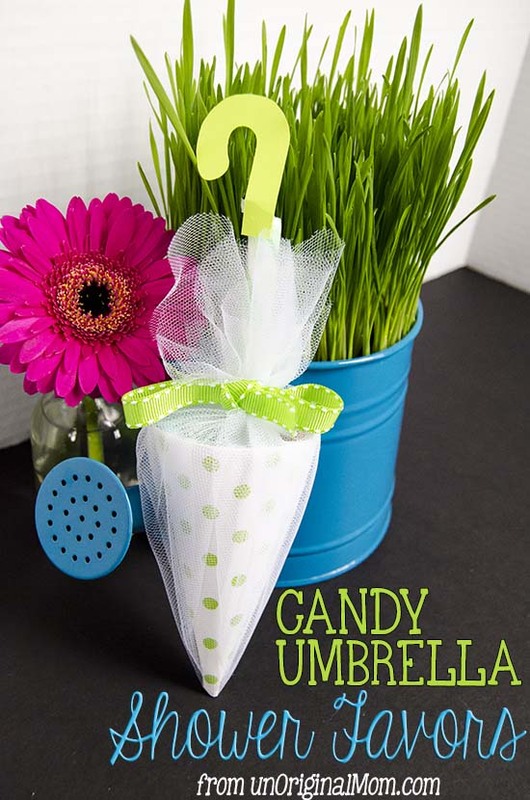 A gift idea which also double as a baby shower centerpiece, is to flip a small umbrella upside down, fill with baby goodies such as dubber ducks, baby rain boots, a rain hat, lotions, clothes, etc, and place it on the table. Guests will be so impressed! Float duckies in a galvanized tub, decorative bowl or bird bath. Number the bottom of each ducky with a Sharpie. Have guests pick a duck as they arrive. At the end of the baby shower, draw a number from a bowl - the guest with the same number on the bottom of their duck wins a prize! Place small round candy dishes into baby rain hats for a cute and crafty candy dish. Dress a teddy bear or two in shiny yellow rain coats. For a clever umbrella baby shower favor idea, give guests mini bath soaps or bubble bath and attach a little tag saying "From our SHOWER to yours!" Print our FREE raindrop template (above) onto white or blue card stock and hang from the ceiling with fishing line or hang from an umbrella that has been hung from the ceiling. You can also attach several to a cute ribbon and use as garland. 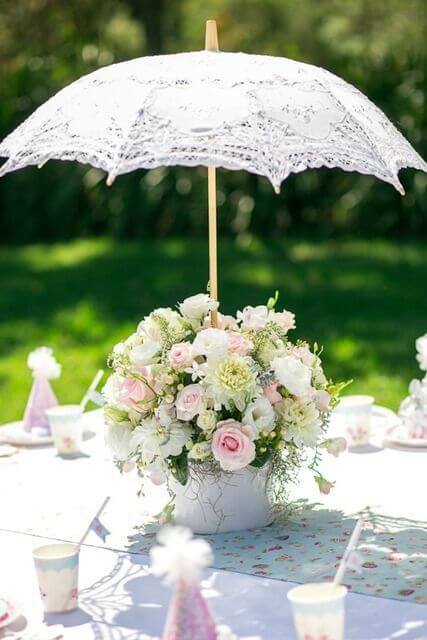 This is a beautiful example of an umbrella flower arrangement table centerpiece! "I threw a shower for a dear friend and the invite had an umbrella on it so we decided to give out mini umbrellas that you could take home and decorate yourself. It was cute with the theme and many of the guests had children so it made for a fun project for them when they got home! We ordered the umbrellas from oriental trading co. for a very reasonable price!"